Each of these six dialogues was written with the idea of giving classical guitarists added opportunities to perform with friends and collegues ensemble music, with each major member contributing equally. These works could add further opportunity for classical guitarists to join with various instrumentalists in settings such as recitals, jury exams, or concerts. 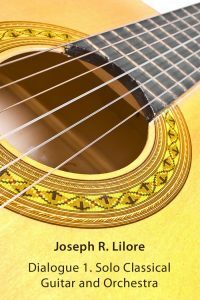 I have composed these six works in order to add to the classical guitar repertory of ensemble pieces for guitarists and mixed instrumental groupings. They are named Dialogues for I have strived to give equal importance to each part in order to create a true collaborative experience for all involved. I also hope to give guitarists an opportunity to join with friends or colleagues. They can be played for enjoyment, college recitals, juries or concerts at a student or professional level. Scores and parts for the Dialogues are now available on Amazon.com, and all six compositions are also available as MP3 downloads.